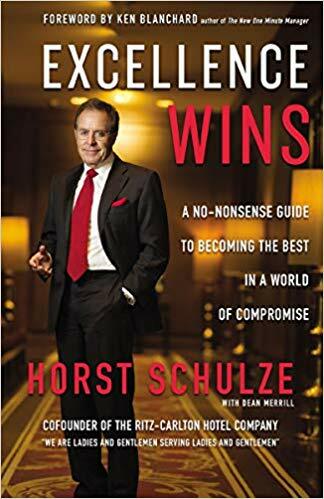 A must read: EXCELLENCE WINS: A No-Nonsense Guide to Becoming the Best in a World of Compromise (Zondervan/HarperCollins by Horst Schulze. As co-founder and former president of the Ritz-Carlton Hotel Company, Mr. Schulze offers an urgent message for today’s business and career growth goals: on caring, today’s most overlooked and undervalued element, essential in any industry or discipline. This is Schulze’s debut book and it patiently distills the guiding principle from his six-decade hospitality career: caring for people above profits. This dedication to personalized care has shaped his success–and can propel anyone toward excellence, he contends. With actionable strategies to achieve growth and customer loyalty through service excellence, Schulze offers an engaging, behind-the-scenes look at his legendary tenure at Ritz-Carlton (he co-founded the company in its current form in 1983, and led its ten-fold growth in hotels worldwide) and early days, from childhood ambition to working in five-star hotels. Having established the company’s now world-famous service standards, Schulze today consults leading companies in a wide range of industries, sharing key insights on individual success, and how leaders can optimize performance of their employees and teams. It was Schulze who established 24 Service Standards for all employees, and empowered anyone on his staff to spend up to $2000 to solve any guest problem or issue. He also put into practice Ritz-Carlton’s iconic mission statement, “Ladies and Gentlemen Serving Ladies and Gentlemen.” His disruptive model has led the company’s global growth and accolades, including two prestigious Malcom Baldridge Quality awards. EXCELLENCE WINS reveals the power of caring for others to determine our success. How we care for people is paramount: “Service always implies caring,” Schulze remarks. “If we settle for lesser goals—meeting the budget, for example, or safeguarding our jobs in a tough economy—we will miss the most important work.” It is excellence in service that secures our future, Schulze contends. Whether you’re a CEO or an entry level associate; lead a startup, nonprofit, or any private enterprise, Schulze’s disruptive principles will guide your service and leadership to the highest level.